In my previous post about the Mersey Gateway I described a new bridge being constructed across the Manchester Ship Canal near Runcorn. There’s another new bridge being constructed across the ship canal nearer Manchester. 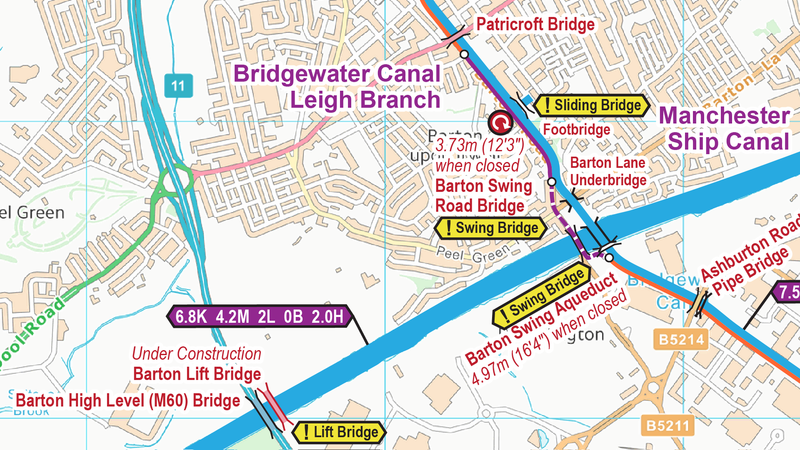 It’s next to Barton High Level Bridge which carries the M60 motorway high above the canal. Despite widening, the motorway bridge is often congested, with local traffic using it between the junctions each side of the canal. The solution is to build another bridge to carry local traffic, leaving the motorway to carry the longer distance traffic. The new Barton Lift Bridge is shown near the bottom of the map. It’s so new that the Ordnance Survey background map still doesn’t show the local roads to the bridge. 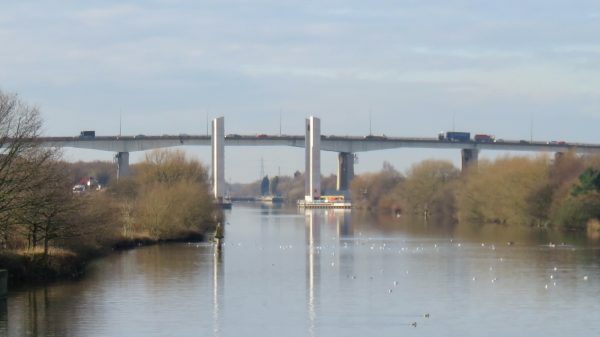 Viewed from the Barton Swing Road Bridge (next to the Barton Swing Aqueduct), on the Manchester side, the photo shows the high level motorway bridge in the background with the four vertical towers for the new lift bridge complete. The deck will eventually sit between these and rise vertically to achieve the same navigational clearance as the motorway bridge. Completion is planned for summer 2016. This entry was posted in Manchester Ship Canal by Paul. Bookmark the permalink.